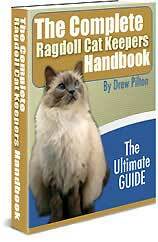 If you're thinking of buying a Ragdoll Cat, it's important to know what to look for and what to avoid. Generally, the cat should be in good health, have no deformities, and have a soft, silky coat. Ragdolls don't show full colors and patterns until two to three years, so don't expect your kitten's colors to stay the same. Here are some things to look for when choosing a Ragdoll. Ragdolls should be medium to large, with an imposing posture and long, sturdy limbs. The body is normally wide and broad from the front and long and rectangular when viewed from the side. The tail should be well plumed and reach the cat's shoulder when you pull it along the side. Check the kitten's balance - it may be heavier around the hip, but this should not affect his posture. Uneven weight can put him at risk of hip dysplasia, although very few cases have been reported. * Bicolor: darker at the face, ears and tail, but with a white marking on the face shaped like an inverted V. The limbs, feet, ruff, and stomach are white, and the nose leather and paw pads are pink. There are very few medical problems associated with Ragdolls, but weather you intend showing your cat it won't hurt to check for problems just the same. Make sure the cat is not coughing or sneezing; viral infections at such an early age is a sign of fragile health. The ears should be free of parasites and the eyes should be clear and bright, with no hint of discharge. The breeder should give you a health certificate and vaccination record. Ragdolls are usually sold at 12 weeks old; your kitten should have been given all basic inoculations by then. One of your first decisions should be whether you want a pet quality, show quality or breeder quality cat. Pet quality kittens are not exact copies of the breed standard, but they are the cheapest and make excellent home companions. Minor flaws such as the wrong eye color, ear shape, or tail length make them ineligible for cat shows, but don't affect their behavior and temperament. Show and breeder quality cats are those that meet or come close to the breed standards. They cost up to twice as much as pet quality cats, and are usually preferred by registered breeders.